During the terrible War of Rage, the Garou brought slaughter to their shapeshifting cousins - the mighty werealligators and the gentle werebears. The defeated breeds hid to avoid total annihilation and were eventually forgotten. Now, centuries later, they venture forth from their swamps and caves to a world that needs their help - now more than ever. But has time mended the wounds of the past or have they only festered? Can Her Wounds Be Healed? 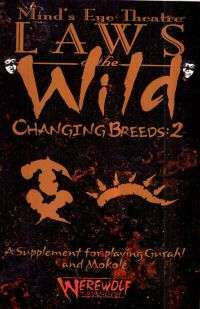 This book contains all-new material for creating and playing one of the Changing Breeds: the Mokole or the Gurahl. Patterned after the first Changing Breeds book, each section contains everything that even a new player needs to become one of these awesome creatures.